Get a free quote right now from Chicagoland’s chimney experts for premier chimney tuckpointing. We’ve served the area for over 30 years and want you to be our next customer. With the unpredictable and extreme weather faced in Chicago, your chimney takes a beating. Over time, it’ll begin to wear down and be in desperate need of repair – which includes chimney tuckpointing. Not every company specializes in tuckpointing like Early Times Home Solutions. It’s a skill that’s rather rare but we’re here to help. 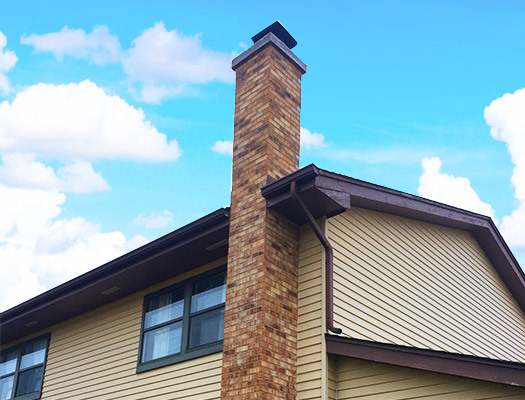 We’ll make sure that your chimney looks great and maintains its structural integrity. The first question we must answer is what’s tuckpointing? Tuckpointing is the repair of mortar joints on your chimney. Mortar joints deteriorate over time with exposure to the elements. Tuckpointing is often overlooked, but it’s extremely important to maintain the structural integrity of your chimney. Over time, mortar decays, making tuckpointing repair crucial. If it isn’t done, the brick of your chimney may become loose and even crumble under its own weight. This is very dangerous to you and could cause extensive damage to your home, surrounding walls and other areas adjacent to the chimney. Why Do You Need Chimney Tuckpointing? 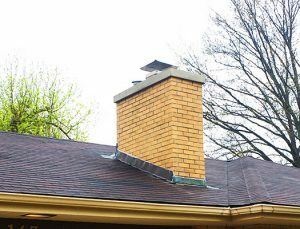 What happens if you don’t repair the mortar on your chimney? For starters, its structural integrity is put into question. This is because there are many cracks and voids in the joints when your mortar begins to decay. Plus, having gaps in your chimney means water can easily seep into your chimney. This can cause water damage to the chimney, leading to much more costly repairs over time. Plus, having gaps in your chimney means water can easily seep into your home causing damage to the inside of your fireplace or surrounding areas. There are many reasons the mortar of your chimney needs to be repaired. The most common reasons are time and weather. Over years and decades of facing harsh weather, it’s only natural for the mortar joints of your chimney to decay. As the mortar begins to decay, the problems with weather get worse. Freezing, thawing and water erosion will further damage the mortar and force it to erode faster. This can cause cracking of the brickwork and popping of the brick faces, caused by expansion and contraction. Another reason is that the masonry work was done poorly when the chimney was built. If there are gaps in the mortar, water can leak into your chimney. Not only does this cause further damage to the structure, but can lead to water damage inside your chimney. As the mortar starts to wear down and decay, your joints will begin to recess, which is a problem. Water will be able to sit and puddle in your brick joints which can cause further problems such as water and structural damage. Also, watch out for stress cracks. They’re very common and often found in the mortar of your chimney. Developing stress cracks is a sign that tuckpointing needs to be done. Some severe stress cracks can even go through the bricks. If that’s the case, you’ll need to have the bricks replaced as well. All of these problems are fixed by chimney tuckpointing. Simply replacing the old joints with fresh mortar will make your chimney look much better and be stronger. It also fills all of the cracks and voids which allow water to leak into your home. We must stress that this is extensive work and should be left to the professionals. If done poorly, it can cause sever damage to your home. We’ve been tuckpointing chimneys for over 30 years and know that it can be very dangerous. So please, if your chimney needs tuckpointing, call us. We start by removing all of the old mortar joints with a grinder. This allows us to have a clean mortar joint so we can then proceed to fill ground-out areas of the chimney. Once everything has been removed, we fill the joint with new mortar and let it set. Once the mortar begins to settle we shape it to fit the joint better and remove any extra. This ensures that any unsightly, hardened mortar doesn’t settle on the surface of the bricks, taking away from its aesthetic appeal. As we’ve previously mentioned, not every masonry company specializes in tuckpointing. In fact, it’s rather rare. If you want your chimney to look great and have structural integrity, you need to find a trustworthy and experienced tuckpointing company. That’s where Early Times Home Solutions comes in. We’ve been tuckpointing chimneys in Chicago for over 30 years. Our chimney professionals are experts in their craft and will guarantee that you’re getting high quality tuckpointing at an affordable cost.